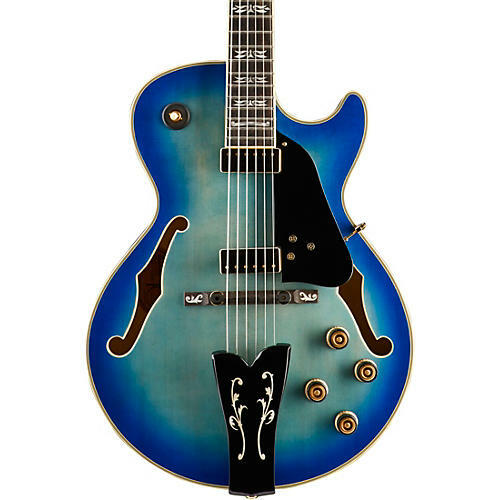 Ibanez first introduced the legendary George Benson Signature Guitar in 1977. Since then, Benson’s signature models have been loved by many and considered the pinnacle of performance for several years. Now, Ibanez proudly celebrates the 40th anniversary of this signature guitar with the release of a new model, GB40THII. The GB40THII features a solid spruce top, whose maturity and performance are highly approved by Benson himself. Containing a fine-sized body and a slim, smooth 3-piece maple neck, it creates an exceptionally open, warm sound while providing an amazing response and loudness with smooth sustain. GB special pickups are installed and float off the body, eliminating feedback and enabling a superbly warm jazz sound. The specially designed 40th anniversary inlay on the headstock, fretboard, and bridge/tailpiece also grace the anniversary of his long-running signature guitar legacy. Includes hardshell case.